A stylish medium sized clumping bamboo with beautiful glossy black culms with a green highlight and large bright green tropical looking leaves. Used in modern as well as Asian garden themes due to its upright habit lending an architectural vertical profile. Great feature plant in a pot or create a grove in your garden. Although clumping bamboos can't get out of control, Timor Black is one of the easiest to control - just break the tips off any emerging shoots you don't want. The young green shoots are edible and the timber is valued as the black colour remains after harvesting. It is quick growing, after 2 yrs in the ground it is 5-6m tall with 12 or so culms. 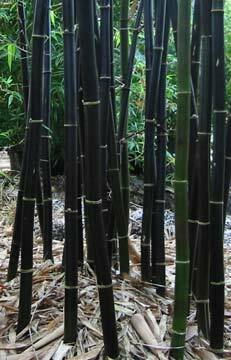 Bamboos are also great screens/hedges and useful for erosion control (due to the matted roots). Limit of 2 per customer please. Full sun to part shade to indoor low light. Can be grown in a pot/indoors but needs a large pot for maximum growth. Once established outdoors this bamboo is frost tolerant and can handle -2C, however its growth is slow in the winter and is part deciduous. Most bamboos are happiest in a moderately acidic loamy well drained soil. If relying on natural rainfall, growth will be greatly enhanced by consistent watering, an annual application of thick mulch, and fertilising several times throughout the year (use natural organic types or lawn fertiliser). Over time the bamboo will create its own layer of mulch from fallen leaves. Suited to ocean sites.